HIV, Plasma Cells, and Interstitial Nephritis: A New Entity? Acute interstitial nephritis is an important finding in biopsies performed for acute kidney injury in human immunodeficiency virus (HIV)-positive patients. Infection and drug-induced injury are the two most important underlying causes. Less common diagnostic entities include immune reconstitution inflammatory syndrome and diffuse infiltrative lymphocytosis syndrome. In a recent article published in the American Journal of Kidney Diseases, Melica et al present two cases with an unusually plasma cell–rich interstitial nephritis that does not readily fit any of the aforementioned possibilities. Absence of highly active antiretroviral therapy (HAART) treatment ruled out immune reconstitution syndrome. Lack of parotid enlargement and CD8-positive T-cell infiltrates in the kidney argued against the possibility of diffuse infiltrative lymphocytosis syndrome. Hepatitis B, hepatitis C virus, and human herpesvirus 8 infection were excluded by appropriate laboratory investigations. Epstein-Barr virus infection is known to cause plasma cell–rich infiltrates in the setting of HIV infection. Viral serology and in-situ hybridization for EBER RNA would be needed to further address this possibility. It is to be noted that Epstein-Barr virus can produce salivary gland pathology. The cases reported here are interpreted as an HIV-driven B-cell proliferative process. Certainly the response to HAART alone supports this possibility. Curiously, HIV p24 antigen was found in the endoneurial sheath of one patient. It is not clear whether this antigen was present in other cell types known to harbor HIV antigens (T cells, macrophages, renal tubules). Has endoneurial infection by HIV been previously documented? This might be an important question to ask. If not, this novel finding can be confirmed by a second technique such as polymerase chain reaction. Immunohistochemistry can occasionally give false-positive results. Whether the two patients reported here are really a new syndrome or a variant of diffuse infiltrative lymphocytosis syndrome would need a study of additional cases. While parotid gland enlargement was not seen, the gland was not actually biopsied, and lymphoplasmacytic infiltrates were documented in the minor salivary gland. Also, the relative proportion of CD8-positive T cells and plasma cells in this condition could vary with the phase of disease, or be modulated by concurrent infections, which are common in HIV patients. 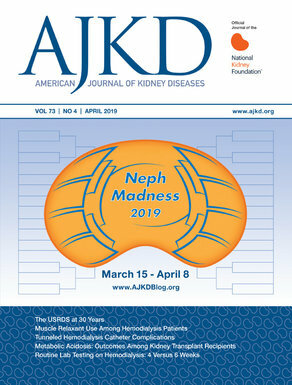 To view the abstract or full-text (subscription required), please visit AJKD.org.